Okay so now I get to tag some people! Today was sketch challenge day over at SCS. I so enjoy these and today was no different. I started with a shimmery, dark blue c/s. Then layered some DP, "Tommy's Toys", by K & Co. Next was the vertical orangey striped bit which was by American Traditional Designs. The horizantal strip of DP is "Grandchildren" by Masterpiece Studios. Both strips were matted with the shimmery blue c/s, as well. I chose one of SU's Summer by the Sea images, matted with some sand-coloured paper by The Paper Co. and the blue c/s. Prismacolor pencils and Gamsol were used for colouring this image. I added the sentiment, a heart-shaped clip with some ribbon and three little resin brads along the bottom. Most likely this will be yet another card for one of the cherished grandsons! Yesterday over at Dapple Designs, there was a colour challenge to use neutral colours such as grey, brown, ivory, white, you know, the muted tones. Nothing came to me yesterday, but today was different. I took a piece of shimmery white c/s and wondered what it would look like, or if it would even show up, if I heat embossed white on white. How would I know unless I tried? Then I wondered, if it did work out alright, would the camera pick it up? I am pleasantly surprised to say yes to both questions. 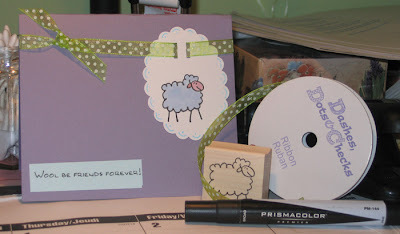 This is my card for Tami's colour challenge part 7. The layout is similar to the post below, but it's a simple card, so a simple layout works, I think. The base is grey Bazzill. The shimmery white is matted with SU's Close to Cocoa and Chocolate Chip. The sentiment and the little dots are from SU's Polka Dots & Paisley set. A bit of sheer ivory ribbon completes the card. Now, onto my lil' angels! The card base with the clouds has been sitting in my craft room for days and days! There was a tutorial done by Kelly at Diaries Of A Stamper about making these clouds and I thought they were just beautiful, so I made a card. Now, what to put on it was the question! Really, nothing came to mind; grass wouldn't work, words wouldn't work, turtles, dogs, cats or flowers wouldn't work. What do we find in clouds, I asked myself? ANGELS, of course. Surely we've all seen them, right? Out came my MissyB Designs stamps and a card was born. This is a 6 x 6 card, again, with the shimmery white c/s (I love it, if you can't tell). 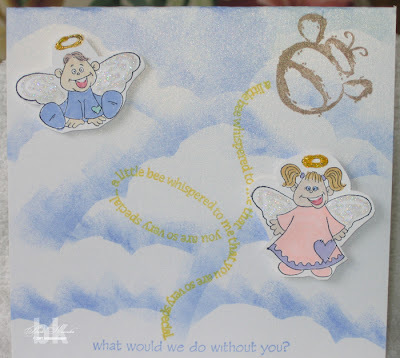 I stamped the lil' angels on regular white c/s, coloured with Prismacolor markers, accented them with Gold Stickles for the halo and Star Dust Stickles on the wings. 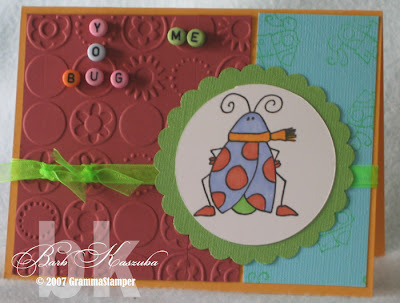 Then I stamped the sentiment on the bottom, also MissyB Designs and added the bee and trail from CTMH's Little Bee set. That's all there was too it! I think this is one of my favourite cards. What about you? I'm a day late in posting this card, but lately, that seems to be the story of my life. "A day late and a dollar short!" The wet water colour challenge was an interesting technique to do yesterday. I used a water colour paper and spritzed it as directed. As I spritzed, I noticed little speckles of different colours appearing on the paper. I don't know if this is normal or not, but it added to the effect for sure. Once the paper was moist, I picked up my Technique Tuesday Paisley stamps. I used a large acrylic block and placed several of the stamps on the one block. I had Kaleidacolor stamp pads in Baby Powder and Flannel. Also a small Metallic pad with gold, silver and copper colours from Wal-Mart. Inked up the stamps and pressed onto the wet paper. As you can see, the ink spreads a little and it looks pretty cool. A dark blue paper by Prism was used for the mat. These papers have a really neat texture to them which, unfortunately, cannot be picked up by the camera. The SU slit punch was used to mount the paisley panel and I added a little bit of sheer blue ribbon on the left. Believing it needed a ltitle something more (as always I never know when to quit), I used the sewing machine to feather-stitch all around. In retrospect, I should have chosen a different colour thread, I think. Once that was done, I noticed a small imperfection and added some bling to cover it up on the bottom right corner. Stamped the sentiment using Paper Tray by Papertrey and called it done! I won't be doing todays colour challenge at SCS because I don't have the colours necessary. I need to place an SU order soon for more cardstock or I'll have to turn in my stamper's badge! YIKES! Many blogs I visit have Flashback Friday which features an early creation by the blogger. It is amazing to see how techniques, eye to details, colour choices, etc. have changed from those early days to current. 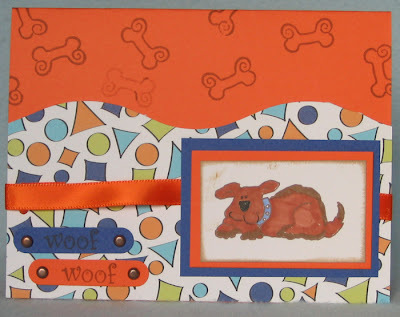 Being no different than many other cardmakers, I have some doozies from when I first began. I have always believed myself to be not very artistic and let me tell you, my first creations prove that to be true. However, I now believe that creativity can be learned, to a degree. While I'll never be an Asela Hopkins, a Nichole Heady, or an Amy Rysavy, I've come a long way baby! Here (on the right) is one of the first cards EVER and I remember being so proud of it. What I don't recall is if it was for a swap over at PCMB. If it was, all I can say is, ladies, I'm truly sorry! It WAS for a swap, a Technique swap, OMG! I redid the card (on the left) today using the same stamps (can't believe I still have them) and this is the result. I didn't use the little tulip stamp as it just didn't fit. It didn't fit the first time, but apparently I didn't recognize it then! The main image is the same and even embossed again, but this time in Egyptian Gold, not silver. I believe my design skills have improved and this, ladies, can happen to you beginner stampers, too. My new found knowledge has come from studying the works of those artists I admire, devoting hours to magazines, participating in message boards such as The Stamp Shack where ideas are exchanged freely and praise and support abound! So, really, I need to say thank you to everyone who has ever inspired me along this journey. And, baby, it's not over yet! Today is Featured Stamper day over at SCS. I visited the gallery of KED and was blown away by the gorgeous cards Kirsten makes. I chose to CASE her card, Petey Goes Fishing. 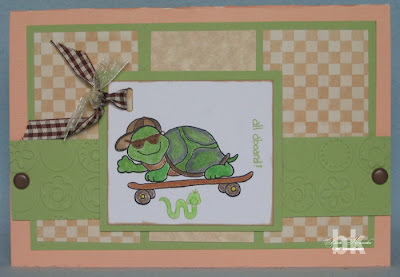 Here is my card, titled, Tucker the Turtle. This card is about 5" x 7". According to Kirsten's blog, Confessions of a Naptime Stamper, it was originally made for a sketch challenge, so I didn't change the layout at all. I changed colours and the main image, but tried to remain true to the layout. I just loved all of Kirsten's cards and it was difficult to choose just one, so I think I'm going back soon to try more. Her attention to detail is amazing. Besides, I'd visit just because I have a daughter named Kirsten, too. My Kirsten is also a Mom of a 1 year old son, Owen. Today was a kind of laidback, slow kinda day for me. My household chores were all done, no visitors were expected to arrive and DH was working on some school stuff for next semester. 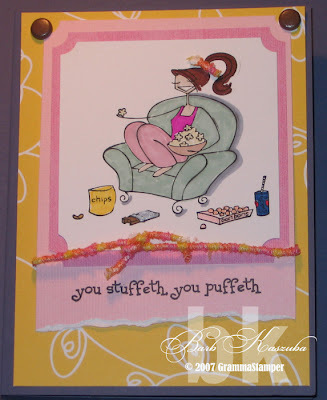 I took advantage of the time and completed my card for Weekend Challenge #3 for Beate's blog, fresh & fun. This card took quite a bit of masking as there are four different images in this scene. All the images are from High Hopes Rubber Stamps Tina's stamps are just delightful, don't ya think? The separate images are the little girl, tall grass, short grass (stamped 4 or 5 times across the bottom) and the sunny face. The only mask I had to make was of the little girl. Then I used the Peerless Watercolors from Stamping Freak. I'm just learning how to watercolor and haven't quite got the blending thing down pat yet, but I'm working on it. There is a colour called Flesh Tone in the pack. If you look at her right foot, it looks darker than the other and most certainly different to her face, which uses the same colour. I'll work out the kinks one of these days. The sentiment was stamped using Paper Tray by Papertrey Ink. 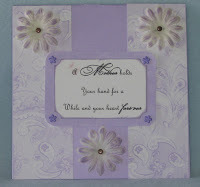 The card base is Bazzill Bling in a lovely lavender shade. I think you can see some shimmery shine in the photo. The patterned paper was from my scrap drawer and I have no idea of its name, sorry. I inked the edge of the card lightly and added some raffia. The image was then placed on the card using pop dots for dimension. All in all, it took about 2 hours from start to finish and I loved every minute of it. Thanks for these great challenges, Beate. I truly enjoy them. Blog Surfing is the BEST! I love hopping from blog to blog to blog! It allows me to keep in touch with so many wonderfully talented ladies who share the same interests, specifically cardmaking, as I do. I can travel from east coast to west coast all in the comfort of my armchair. And that's a bonus for me because I do have difficulty walking. In fact, I'm awaiting a date for surgery to have bi-lateral knee replacements. Yup, both at the same time. Blog surfing keeps me from going insane and I'm so greatful for all of the challenges that people post. Yesterday morning, while blurfing, I saw that Allison over at Stampin' When I Can had posted a challenge and I made this card. 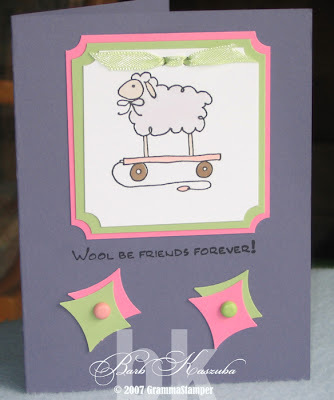 The image is from Hambo Stamps and the sentiment is by Pink Cat Studio. The orange c/s is SU and the blue bits are by Prism Papers. I'm actually going to send it to my grandson as he loves dogs and laughs those wonderful baby belly-laughs when he comes into contact with a dog. He's going to be 1 year old next month so I don't think he'll really understand the card, but I like making them. So far, I've made him about four birthday cards! LOL. Sorry, I digress. Allison's blog is fantastic. 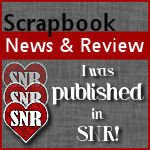 I usually start my day over there where I can find out at a glance what's going on in the papercrafting world. Thanks, Allison, for keeping us informed and letting us know all the good spots to visit! Later on in the day, while still blurfing, I found another challenge at Dapple Designs, a blog hosted by Tami. Both Tami and I are members of The Stamp Shack. This time it was a colour challenge using turquoise, brown and lavender. Certainly sounds like an unusual combination, but it turned out fairly well. See for yourself! I added a little "bling" to the wings and doodles in the background. The image is from Maryse Carrier and, of course, that old standby, Doodle This by SU. How we managed without doodles, I don't know! Thanks, Tami, for a terrific challenge. That's it for now, but there are more challenges coming up in my future, so there may be a second posting today. This is just so much fun! See you again soon. 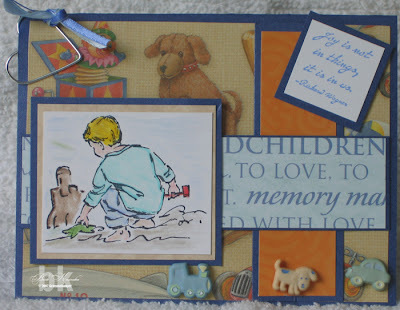 While blog hopping, again, I stopped by Amy Westerman's blog, Heartfelt Greetings. Every Sunday she posts a sketch challenge, however, today she added a little twist. We were to add paper piecing to the mix. Great challenge, Amy, thanks so much. This card is my version of this sketch. I'm a day late, but I don't believe there is a time limit. 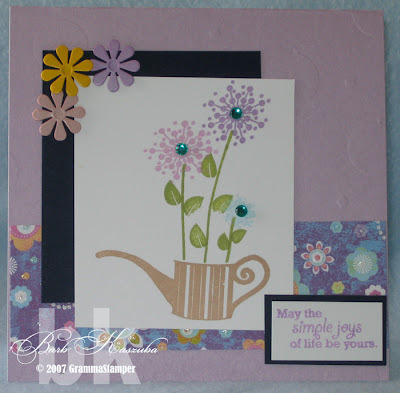 The image is from I Brake for Stamps and the sentiment is Stamping Bella. For the robe and PJs, I used paper by K & Co. The rest of the image was coloured with Prismacolor markers. Cardstock by SU in Certainly Celery, Brocade Blue, Regal Rose. I added the brads as I thought it needed a little something more. This card was for the SCS challenge for trying a new technique. You can see the challenge here. The technique for today was to do Crayon Resist. I had never done this technique before and really wanted to give it a try. This card is the result! 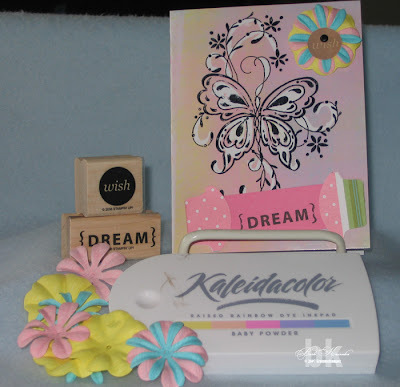 I chose this beautiful butterfly from The Artful Stamper. I think it lends itself well to this techinque. I used glossy cardstock, stamped the image with StazOn black ink. Then I used a white crayon and coloured areas that I wanted to be left white. Then, using Kaleidacolor in Baby Powder, I brayered the entire cardface. The coloured ink will not adhere where the crayon was used. It's like magic! Then I added a couple of words from SU's Think Big set, put flowers from American Crafts and called it done! I really love this card and now wonder why I was so afraid to try this technique. It really is simple. 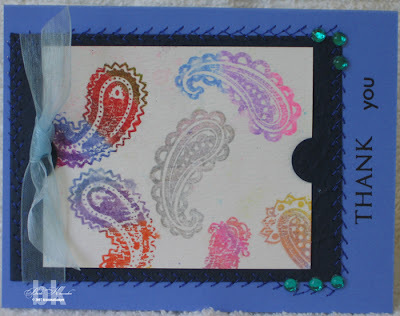 Today on SCS it was Featured Stamper challenge. Today's FS is Vitality and she has fabulous gallery. You can see the card I "cased" for this challenge here. 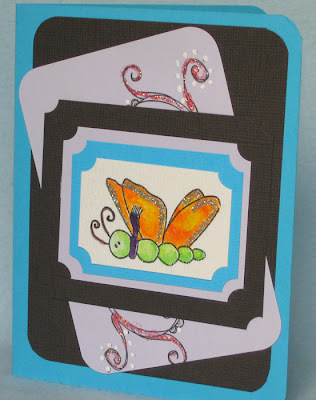 For this challenge we choose a card and make it with a couple of changes of either colour, stamped image; at least two things must be changed. I changed the colour scheme and the way the sentiment was mounted, mostly because I don't own the tag punch, YET! I also added a couple of little flowers from the Papertrey Ink Green Thumb set. The cardstock is from the Spring Harmony Collection by CTMH, as are the inks I used, except for the Certainly Celery for the flower stems. I am really enjoying these challenges and am looking forward to seeing what next week brings. That's right, when I see a challenge, I must attempt it! I keep up on two message boards, The Stamp Shack and SCS. The CT over at The Shack has started Color Challenges on Friday and I am compelled by my own sick, twisted, addicted mind to go forth and create!! Who cares about breakfast, lunch or dinner. Not I. When the gauntlet is thrown down, I must pick it up. Is there no help for this rubber stamping obsession which has taken over my very being? Perhaps I'm being just a tad melodramatic, but it was fun! So, the first challenge I completed today was for SCS LCS116. We were to use one flower stamp, no 2-step stamping. It could be just one flower, a bunch of flowers, with a creature, without a creature, etc. as long as it was just ONE stamp. We could use up to 3 colours of c/s, brads, ribbons, flower punches, etc. Here's my take on this Limited Supplies Challenge. The flower stamp is Inkadinkado, the b/g is SU's Polka Dots & Paisley. 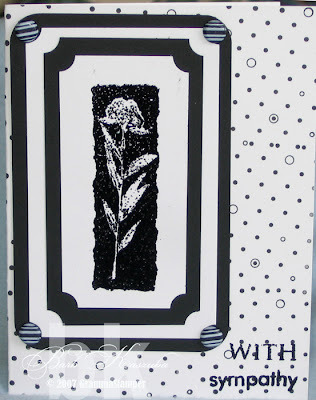 I used VersaMark and black embossing powder on the flower and sentiment which is from Papertrey Ink and Versafine for the b/g. The only embellishment are the Jazzybrads. I thought this turned out alright for a sympathy card. What do you all think? I'd love to see your comments as my DH didn't like it! This afternoon I sat down to do the colour challenge for The Shack. We were to use Certainly Celery, Almost Amethyst and Cameo Coral colours. I chose this cute little lamb from SU's Everyday Creations, mounted on Certainly Celery and Cameo Coral, used a punch also from SU, added a couple of brads. The sentiment is by Gina K Designs which can be purchased from The Stampingfreak. Well, that's what I've done with my day today. I'm just challenged! Have a great weekend, everyone! Today's challenge at SCS was to use your small stamps, no bigger than 1-1/2" square. I thought immediately of the SU Mini Mate set which doesn't get used as much as it should! However, I had some difficulty in coming up with a layout so I dragged my mouse over to PageMaps for some inspiration. This particular layout called me, but only after I tried one that I screwed up! I used Bazzill Bling c/s for the base of this 6 x 6 card, added some patterned paper which I've had forever and therefore can't remember who made it and punched circles with my CM punches. 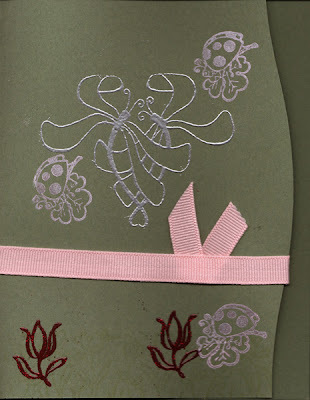 Then I used the flower stamps from Green Thumb by Papertrey Ink. I coloured the little hedgehog with Prismacolor pencils and stamped the flowers using SU inks and Colorbox Chalk Petal Point inks in the following colours: Ballet Blue, Summer Sun, Green Galore, Rose Coral and Wisteria. I then added the sentiment and some Jazzybrads. If you haven't tried any of the SCS challenges you should. They are really great for getting the creative juices flowing. Go on, you know you want to and most importantly, have FUN! I'm telling you, I'm hooked on these challenges. Today over at SCS is sketch challenge day. This card is for SC124 which you can see here. It's a terrific sketch by Roxie, aka Rox71. I just love the unusual lines of this sketch and decided to have some fun with it. The base is SU black c/s. 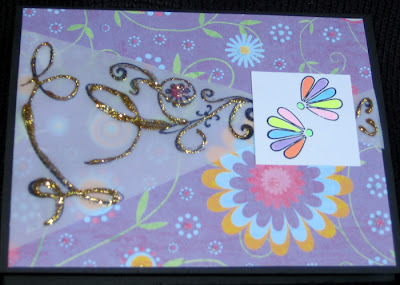 On top of that, I layered some DCWV Posies Glitter Print paper. It's a little heavier and comes with glitter already on it. I had some difficulty in finding a complimentary paper for the triangular shapes, so decided to go with vellum. My DD, Tiffany, recently sent me a package of goodies for Mother's Day. Amongst the goodies was a set of Gel-a-Tins Build Your Own Flourish stamp set and I just had to use it today. I stamped some flourishes on the vellum, using StazOn ink, of course, then added some gold stickles. I think I got a little carried away with the stickles, but "live and learn", I say. I stamped the little flower using SU's Polka Dots & Paisley set and coloured it in with my new Souffle Pens. Love those darn things, don't you? Well, there you have it. My card for SC124! I had every intention of entering this card over at Poetic Artistry. There was some terrific blog candy to be had. All you had to do was make a card, based on the sketch provided and get it in before the counter reached 25,000. When I printed the sketch, the counter was at 24,818. Lots of time, right! NOT! I made the fatal error of going to bed for the night. Got up this morning and WHAM! the counter was at 25,224 and the contest was closed. What to do? I loved the sketch and wasn't willing to give it up, so I mosied on over to check out the challenge at SCS. Lo and behold, I had the colours required, the layout I wanted to use (with a couple of little changes, since I couldn't enter her contest anyway) and had already picked the image. Here's the card for CC114. This ladybug image is part of the "Les Insectes" from Maryse Carrier. Lesson Learned: She who hesitates is lost! Hopefully, this won't happen to me again! No more sleeping for this chicky, believe me! Each Sunday, Amy Westerman of Heartfeltgreetings posts a Super Sketch. Today I decided to give it a whirl. I had been thinking during the night of something I wanted to try and it works well for this challenge. I'm just surprised that what my brain conceived, my fingers actually carried out today. Believe me, that's not always the case! There was a lot of masking involved in this, but I like the way it turned out. The base is Bazzill c/s, the DP is by SU, flower stamps are PaperTrey Ink, except for the yellow daisy, which is unknown, the jeans pocket and bee are CTMH. The sentiment is computer-generated. Inks used were all SU colours. Thanks, Amy, this was a great sketch and I think this card is definitely one of my better cards to date! I can't grow flowers, so I stamp them! Over at fresh & fun, Beate's blog, the counter is approaching 200,000 hits. Yeah, that's a BIG DEAL alright and she is celebrating with some goodies to give away. All you need to do is make a card using the posted layout and post a comment, linking to your card. So I did and here is my card. 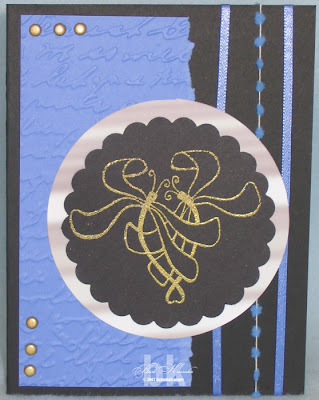 I used a textured cardstock, from Creative Memories, for the base and Night of Navy, and Whisper White for the mats. I added a strip of patterned paper, sorry can't remember which company. The images are from Papertrey Ink, the Green Thumb set. In the centre of the blooms I added some green crystals and the flowers in the upper corner are from Ms. I'm off now to put a comment and link on Beate's blog. WOW! I can't believe it's been a week since I made my last post. I've been a bit blue lately and everything seems to be a challenge. So, given that I already feel challenged, I decided to take part in my FIRST EVER, Splitcoaststampers Challenge. This card is for the LSC115 challenge, which you can see here. The image and sentiment are from Gina K Designs. 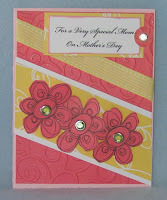 I stamped it on normal, white c/s, then punched out using the scalloped oval giga punch. Please don't ask me why I coloured him blue 'cause I don't know! I suppose some psychologist would have loads of fun with this artwork of mine, given my present mood. However, the cloud is slowly drifting away and the sun will shine again. Sorry, I digress. 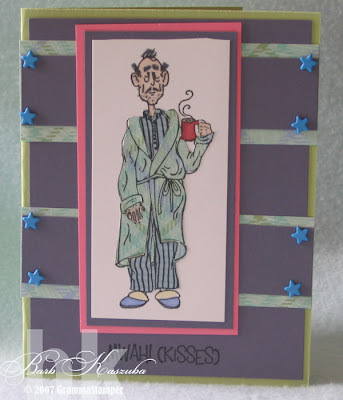 I added the green polka-dot sheer ribbon and used CTMH cardstock for the base. Very simple and lots of Wide Open Spaces, as required! I think I'll participate in another challenge soon, this was fun! ....because I spend it all on Stamping Bella stamps! Friday's mail delivery brought this wonderful Beerafella to my house. He's very demanding and wanted to be used right away. (Oh no, another fella in the house demanding my attention.) I could barely get myself organized before I had to make this card. So, here he is, my McDreamy! 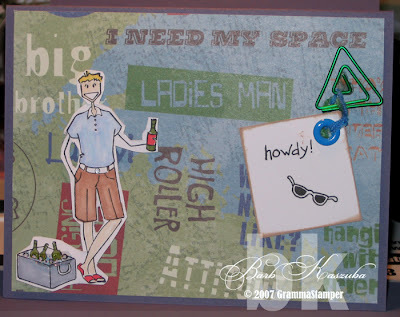 The "howdy" and the sunglasses are from the Sporty Turtle set by Inky Antics. Well, I was just putting the finishing touches on Beerafella when I heard these little simpering noises over on my right side. I put down the markers and listened more intently. Who woulda thunk that PMSabella was having a "hissy fit" because she wanted her own card, too. Really, had I known McDreamy and PMSabella were going to be so difficult, I would have left the package unopened for a couple of days. YEAH! LIKE THAT WOULD EVER HAPPEN! I'm just very grateful that Surfafella is so laid back and is happy just lying around the beach waiting his turn to "hang ten". At least somebody is considerate around here. There were other goodies in the package, like a bunch of sentiments and Staceyfishabella and a Teddybella (so cute) and some of that BEST paper Em sells that's as smooth as a baby's bottom. That will be used sparingly, to say the least. I will keep it for only the most momentous occasions. You know, the kind where you break out the Dom Perignon! Can you believe it's May already! And that means Mother's Day cards. Sadly, my Mom passed four years ago, before I started stamping and making my own cards. Therefore, she was never the recipient of a card made with love by my own hands. This year I decided to make some Mother's Day cards anyway. I called my daughter, Tiffany, in Toronto and asked her if I could send some to her and would she mind showing them to her colleagues at work. She was quite willing to do that and suggested I write a little blurb so that she could post on the intranet at her place of business. I had to laugh because when she said I should do it because her blurb would read something like, "My Mom makes cards, wanna buy one?". I thought I had better do my own. I did, she posted and sent me an e-mail saying I had my first order. Off the cards, seven in total, go to her. She called me last week and literally gushed over my cards. I can't tell you how pleased I was to hear my eldest daughter telling me how great my cards look. I mean, really, those of you with children, how many times in your life, and their's, have your kids told you how great you are at something? In reality, we all know that our children know more than we do at any given moment of the day so you gotta know I was lapping this praise up like a kitten with a bowl of milk! Then, Monday she called me and asked me to make two more of a particular card, as a special order, and five more Mother's Day cards because they're selling like hotcakes! YIPPEE SKIPPEE! Anyway, here's three that I did today. I'll be back at it tomorrow, too and then I'll Xpresspost them on Friday so as not to disappoint my fans.....sorry, customers. LOL! 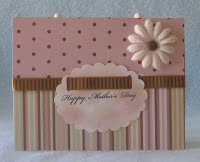 The middle card is based on a card I saw at Much to Stamp, a blog by Julie Mutch. Thanks to Julie for the inspiration.